I'd make some joke about how they finally caught up with me but I'm usually on the right side of the law so this doesn't really make a whole lotta sense. [Derek's going to pause here a moment, mess with the video a bit so it goes off then on again as he figures out how it works. Then he smirks, shakes his head.] And I'm supposed to believe we're under the ocean? Honestly? I gotta say I feel like I'm being pranked... no matter how elaborate all this is. Just look at you guys, all bright eyed bushy tailed. How are you, Marina? I realized I missed newbie day and thought that there's something missing from the Welcome Baskets. [ With that, he holds up a flyer -- ] You know how you're kinda given a heads up with the brochure that tells you about our Wardens who can play around the space-time continuum? 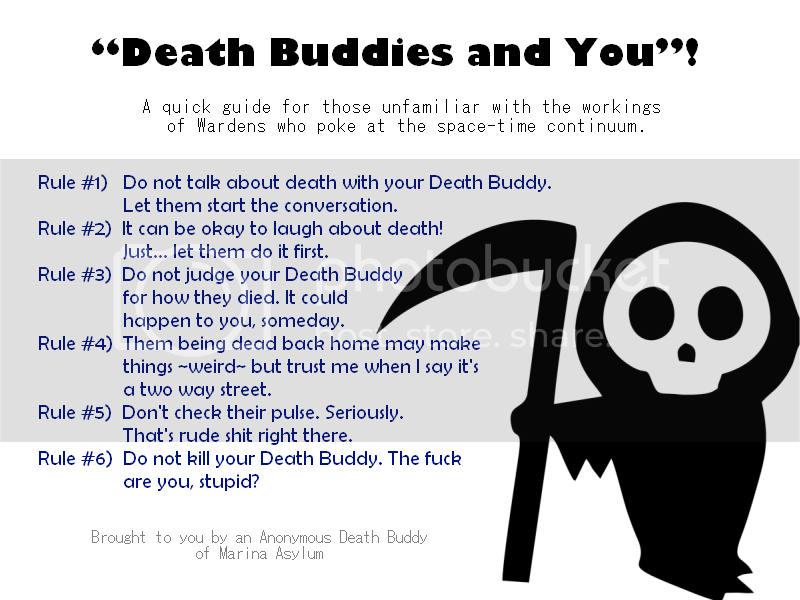 Well some kind soul thought that isn't enough so we have this helpful little pamphlet here: "Death Buddies and You"! [ Then holds up both of his hands as if to stop protests. ] Now now, we're not here to make fun of dead people, just to make sure that people know what they're facing here. I'm no specialist, but if you've got questions I'll do my best to answer. We're handing these out around Sector 0 near the Shelter so inmates old and new are welcome to 'em. [ If you walk the halls of the Education Center, particularly the one leading to one of the art rooms, one will detect first the light scent of tobacco. Should one look inside, they'll see the winged and haloed lady working on a painting -- sketches scattered on one table (with some fluttered to the floor), containers for primer and medium on another, along with brushes and palette knives haphazardly put in jars and tubes of paint. The vent hums as the painter quietly works. Occasionally she flicks the ashes of her cigarette into a nearby ashtray -- if she remembers to do so; if not then the ashes fall to the ground. [Okay, so he’s breaking out the Spidey-voice.] A welcome basket… it’s so… welcomey, thanks. … Okay, so. I guess this where I’m supposed to cut to the chase and throw out the big names, and hope someone I know’s here. But the crowd I tend to tangle with happens to consist entirely of super villains and general baddies. I guess that says a lot about my social life. And I know I should hope that they’re here, being prison and all, but… This place is way too nice. I don’t want to imagine Kraven kicking back at the beach. I prefer thinking of him in his gulag. Safe and sound, and away from everyone else. … Ugh, how did this happen. I bet the X-Men don’t get thrown in jail.